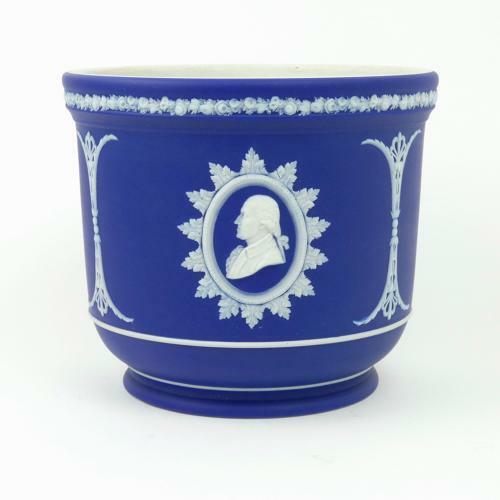 An interesting, Wedgwood, dark blue jasper dip jardiniere with portraits, in relief, of American presidents. This piece is marked 'WEDGWOOD ENGLAND' and it dates from c.1900. It is decorated with three portraits, two of them being the same relief. The two which are the same are of Benjamin Franklin and the third is George Washington. In the past we have had jardinieres like this which have three different portraits with the other one being of Lafayette. On the day this was made they must have misplaced the mould for Lafayette and resorted to putting two of Franklin instead. Each portrait is surrounded by an attractive foliate border and there is a narrow border of flowers to the rim. The reliefs are very good quality and the piece is in very good condition. There is a small firing fault on the shoulder of one of the busts of Franklin.